Between clients and visiting guests, these have been busy days. Still, I manage to find some time to get into the kitchen and cook. This evening it was an attempt at double-crust stuffed pizza pie. Unlike “deep dish” pizzas, which are single-crust pizzas with a very thick layer of toppings, a double crust stuffed pizza has the first layer of crust topped with all the normal pizza toppings minus the sauce, wrapped with a second layer of crust. The sauce, a bit drier and chunkier than normal, is put over the top crust and then the pie is baked. I first tried this style of pizza in the San Francisco Bay Area at Zachary’s and Little Star. In addition to making my own crust, using Tipo 00 flour from Italy and some rosemary from my garden, I made my own sauce, cooked some spinach, and cooked some mushrooms, draining them so there wouldn’t be too much extra liquid. 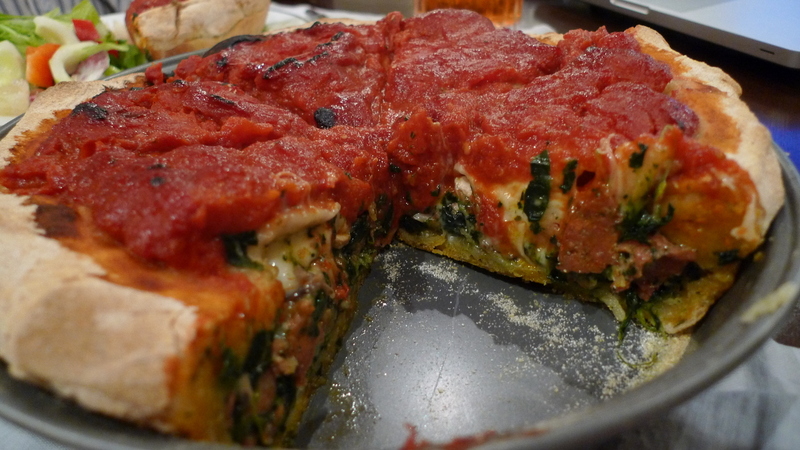 After placing the bottom layer of dough in a cake tin, I added alternating layers of the ingredients: cheese, spinach, mushrooms, and pepperoni. 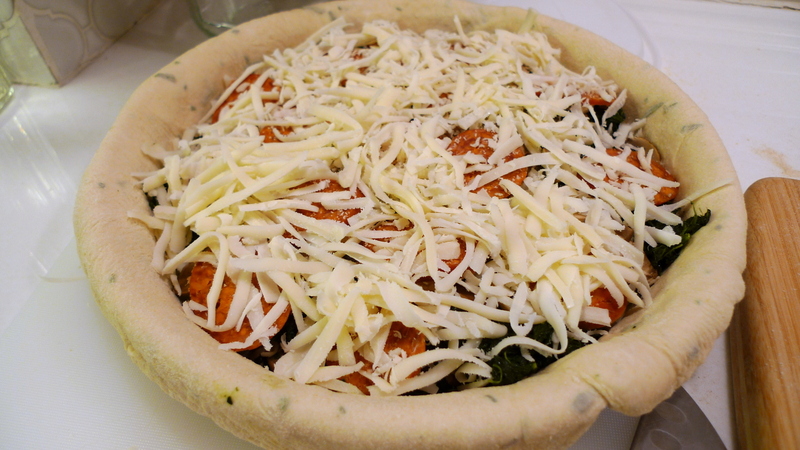 This video shows me adding the second crust, tucking it in, and adding the sauce. The only part of the pizza that was a problem was too much crust along the sides. In the future, I think I would cut the top dough to fit and just pinch the seams closed instead of having an overlap and folding the pieces together. The end result was beautiful. The crusts were crisp, the interior ingredients were a cheesy mass, and the slightly spicy sauce cut through the richness of the fillings. 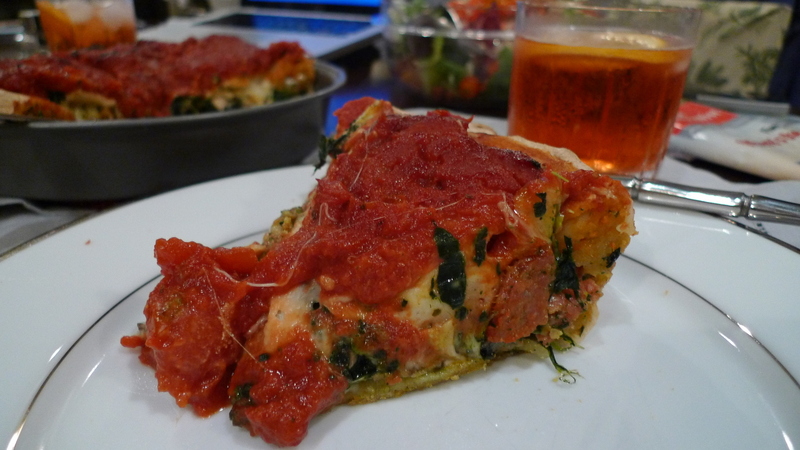 This entry was posted in Cooking, Food and tagged cooking, Crust, Deep Dish, Double, food, Italian, Little Star, pizza, Stuffed, Zachary's by christao408. Bookmark the permalink. That pizza pie looks fabulous! I just love it. Nice and quick way to make dinner, Chris. What other ingredients you added? I think I saw a few pieces of ham? Pepperoni, spinach, mushrooms, and cheese. Oh my now I am drooling. Yum!!! Have a good week end.